Vietnamese firm H&P Architects has created a unique “cave” fit for human habitation. 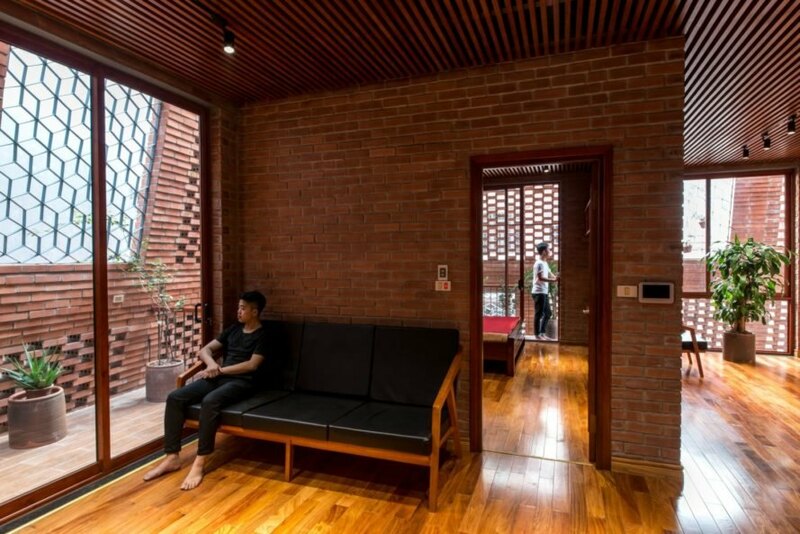 Their “Brick Cave” townhouse has three levels of brick walls, each one with apertures that create a playful atmosphere of light and shadow throughout the interior. Pockets of greenery accent the brick construction throughout the house, and a vegetable garden on the roof caps off the structure. 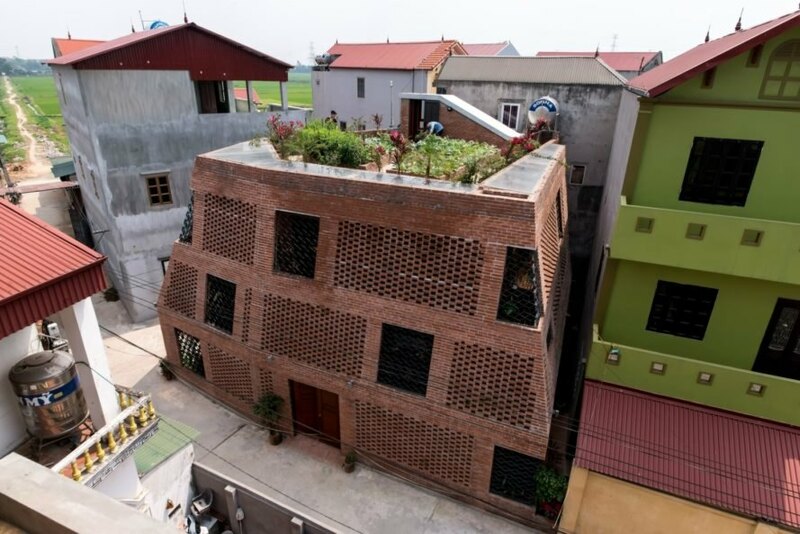 Built on a corner lot in Đông Anh, Vietnam, the home is nestled on the street and blends into the urban landscape. 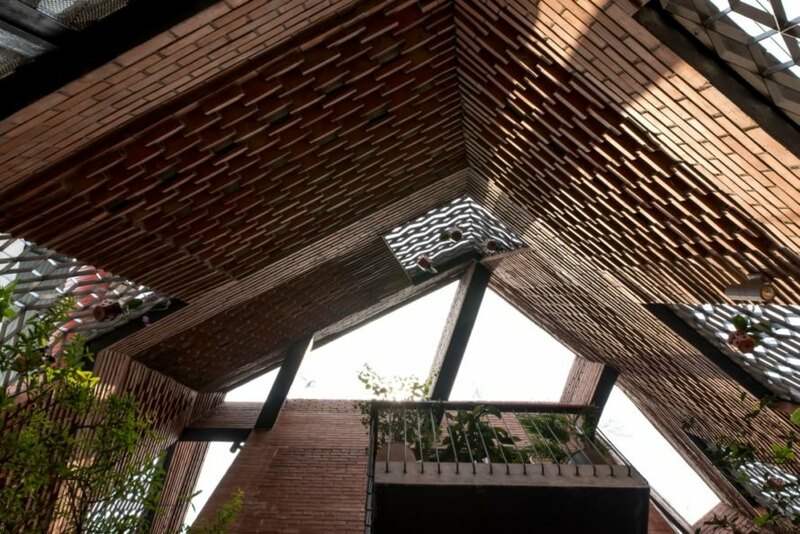 The architects chose to use brick in the construction to create not just a unique home design, but one with an ecological shade system. The multiple walls both filter natural light into the home and shade the interior from the region’s searing summer heat. The idiosyncratic design is a labyrinth of walkways, stairs and angles illuminated by streams of natural light. In fact, to use the sun to the home’s advantages, the architects conducted a number of studies on the sun’s daily positions in relation to the house. Although the apertures may appear a bit random at first sight, they were strategically implemented to keep the home cool in the summer heat while providing as much natural light as possible. In addition to having various openings, the walls are slanted inwards. This represents another conscious choice on the part of the architects–the slanted walls provide better viewing angles of the surrounding area and add a sense of nature to the design, letting in elements such as rain and wind. Harsh elements are commonly to blame for house flooding in this region, so the architects wanted a resilient design that would aid in protecting the home by letting the elements pass through it rather than crash into it, essentially creating a safe shelter. 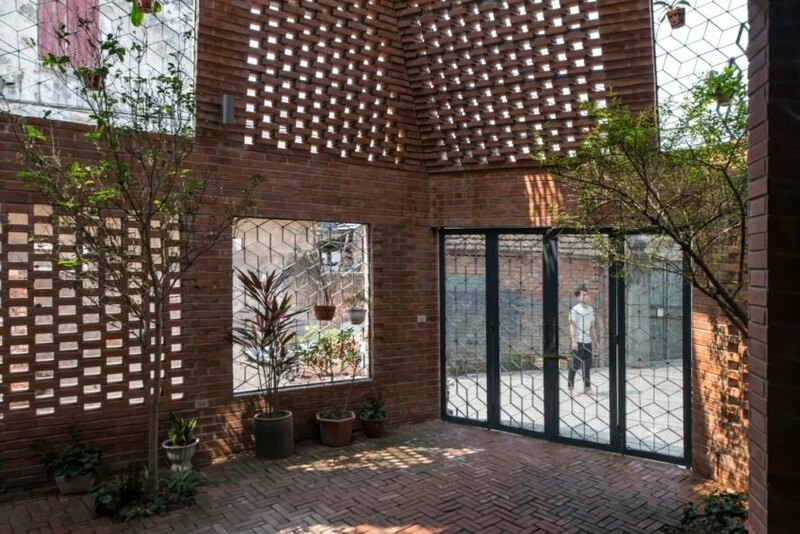 Vietnamese firm H&P Architects have created a unique "cave" fit for human habitation: a house made out of multiple layers of brick with various cutouts. The idiosyncratic design is a labyrinth of walkways, stairs and angles illuminated by streams of natural light. To use the sun to the home's advantages, the architects conducted a number of studies on the sun's daily positions in relation to the house. 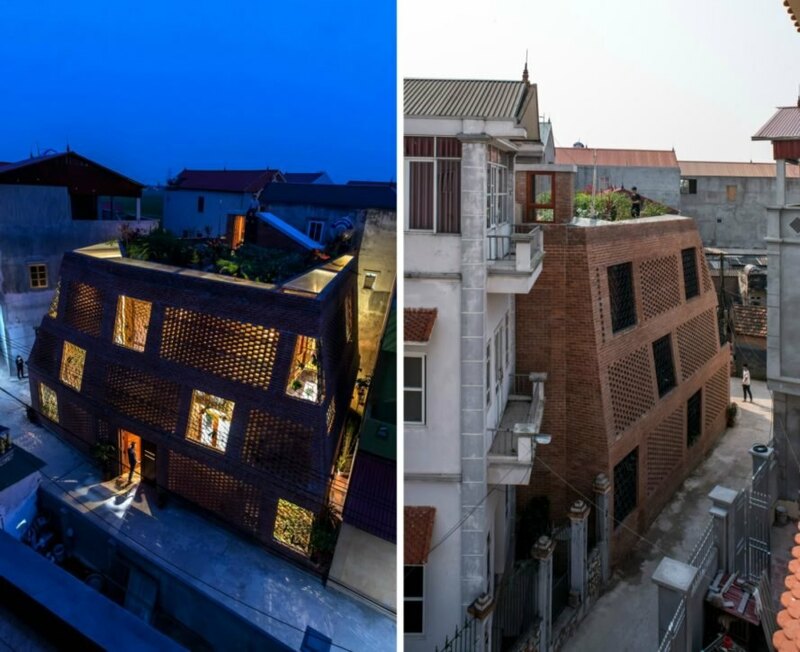 Built on a corner lot in Đông Anh, Vietnam, the home is nestled on the street and blends into the urban landscape. 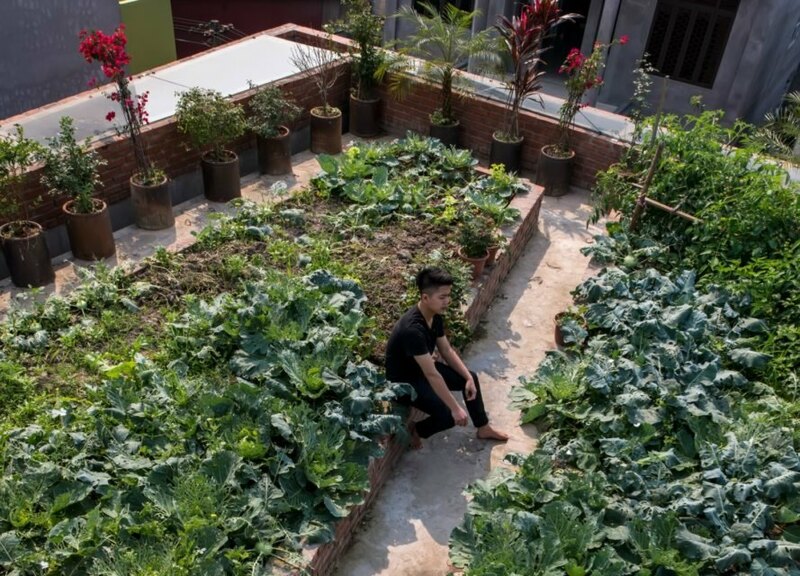 The home has a large vegetable garden on the roof. Harsh elements are commonly to blame for house flooding in this region, so the architects wanted a resilient design that would aid in protecting the home by letting the elements pass through it rather than crash into it, essentially creating a safe shelter. 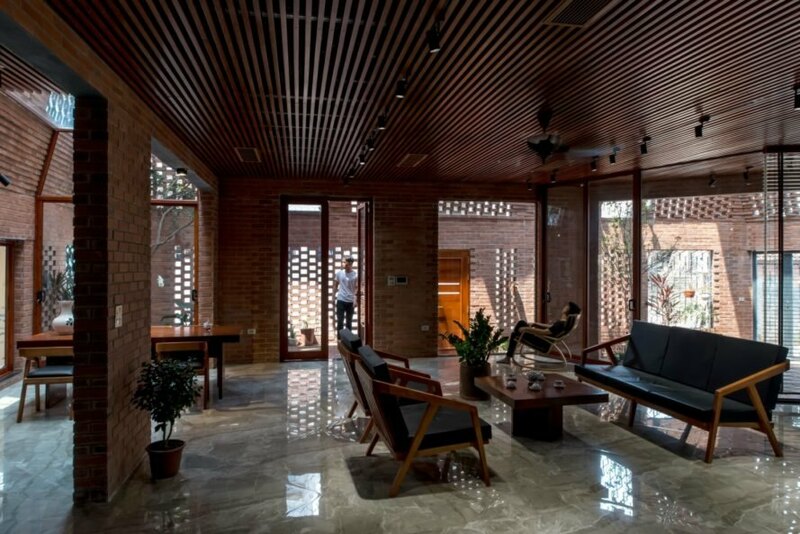 The architects chose to use brick in the construction to create not just a unique home design, but one with an ecological shade system. The multiple walls both filter natural light into the home and shade the interior from the region's searing summer heat. Although the apertures may appear a bit random at first sight, they were strategically implemented to keep the home cool in the summer heat while providing as much natural light as possible. Pockets of greenery accent the brick construction throughout the house, and a vegetable garden on the roof caps off the structure. The home's interior has plenty of natural light. 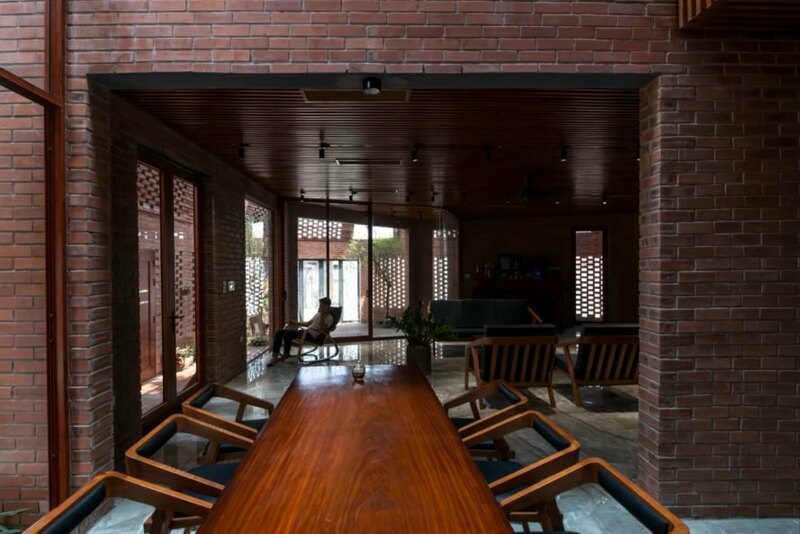 According to H&P Architects, the unconventional combination of bricks and greenery was essential to connect the home to its surroundings. The home's design blurs the boundaries between interior and exterior. In addition to having various openings, the walls are slanted inwards. The various openings let in light throughout the interior. The slanted walls provide better viewing angles of the surrounding area and add a sense of nature to the design, letting in elements such as rain and wind. The home's interior uses a minimalist design that puts the focus on the light. 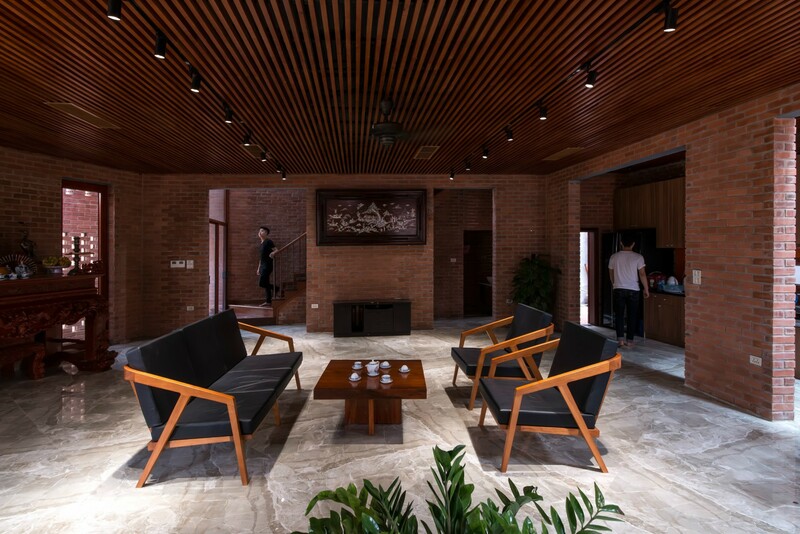 The brick walls are slanted to provide a sense of connection with the interior. The brick design provides optimal light to the interior. The interior is well-lit at every angle. 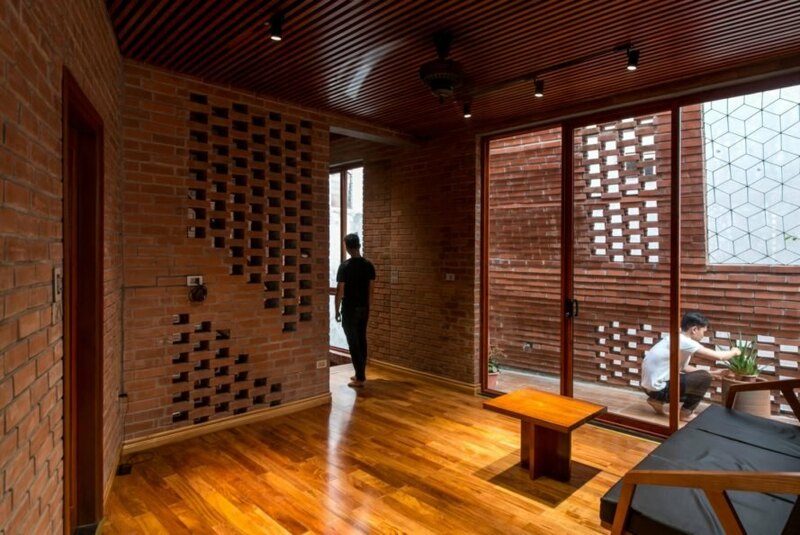 The brick wall system continues throughout the interior. Layout of the Brick Cave by H&P Architects. The architects conducted several studies on the sun's position in relation to the house throughout the day.